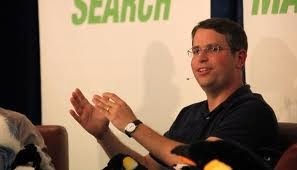 Do you watch Matt Cutts on YouTube? If you don't, you should. He typically posts to the Google Webmaster Tools channel, here. He's a very interesting character, and I always think about him like Google's "press secretary" or "spin doctor." Meaning... I am sure he's an honest enough guy and all that, but his job is to interact with the public, especially the SEO public, and he "spins" issues to Google's favor. He's anything but an objective third-party observer; like the White House press secretary, his job is to put for the public line for his boss. For a more objective but "less inside" look at Google, I turn to people like Rand Fishkin or Danny Sullivan, as they do not work for Google but are very serious SEO- and Google-watchers. Matt is incredibly important to SEO, but always remember who pays his salary. But back to Matt Cutts and his recent video. One of his more interesting recent YouTube videos was entitled, "Is there a version of Google that excludes backlinks as a ranking factor?" Let's read just a bit between the lines. A listener asks where there is a version of Google that excludes backlinks from the algorithm. Matt answers no, not for public consumption; but yes for internal consumption. Then Matt explains that "despite" the noise and spam in backlinks they remain very important to search quality. So backlinks - links FROM other sites TO your site - STILL matter. A lot, clearly. So much so that Google can't live without them, even if - internally - it might be trying. Matt doesn't say that Google will transition away from them, nor does he speak at all about Google+ or other social mentions. He clearly indicates that backlinks matter, and really doesn't even hint at any alternative (social mentions? author authority?) coming down the pipe in the near future. That, along with recent posts by Matt Cutts against guest blogging and article marketing (two attempts to manipulate backlinks), imply that we should all continue to focus on getting "quality" back links in every way, shape, and form possible WITHOUT running afoul of Penguin. etc. Do backlinks matter? Yes they do. Thanks for the clarification, Matt! Is Facebook Relevant to People (or to Marketers)?